Lighting is a design field in itself, and the options are ever more endless! We spend many hours tracking down unusual and interesting objects from around the world to complete your design. 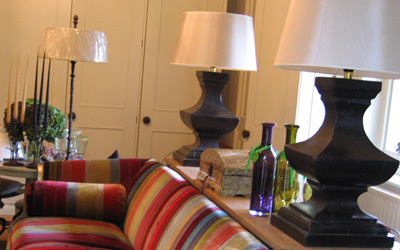 You'll find lighting to meet the needs of any room, whatever design or theme you are looking to create. Our lighting range covers wall, ceiling, hanging, lamps and more and with a wide range of lighting styles from well known designers as well as new discoveries you're sure to find the lighting you've been searching for. We can help advise, source and choose lighting from individual lamps to complete solutions for your entire home or workspace. If you've seen a light you like, whether it's in a magazine, on TV or even in a friends home! we can help you find it, install it and enjoy. Beautiful lighting can be a stunning focal point for any room, whether turned on or off!